stansing på møteplass Senator Antonio Trillanes IV on Thursday released the result of his drug test which showed he is negative of illegal drug use. 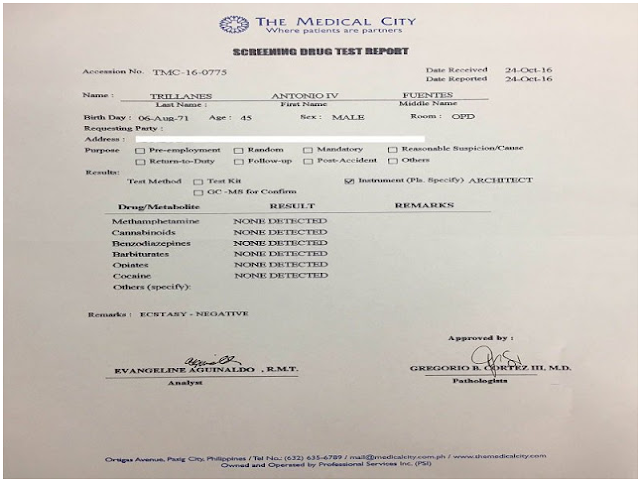 The drug test report from The Medical City was posted on Trillanes’ official social media account. Trillanes tested negative for all illegal drugs, including cocaine. But the netizens insist that he should do the test in PNP for an accurate result. The senator earlier challenged the son of President Rodrigo Duterte, incumbent Davao Vice Mayor Paolo Duterte, to undergo a comprehensive drug test, and to name the senator supposedly using cocaine. According to Vice Mayor Duterte, he knows one senator using cocaine. dating betal med mobil READ ALSO: Actor Rez Cortez tagged as Drug Protector.